Considered to be one of the oldest and important monuments, the Raidongia Dol is located in Kalakhowa region. The Dol is about 45 feet high and has relics from the Ahom Kingdom which includes 14 statues. Historical evidence says that the Dol was given as dowry to Raidnogia Barua by Swargadeo Pramatta Singha for his sister’s marriage. The pond nearby adds beauty and charm to the premises. The 14 remaining statues are a reason why tourists still come here to get a glimpse at ancient Ahom tradition and culture. Located at the banks of Disang river, Dehing Namti Satra is 8 miles away from Naharkatiya town. Theses Satras were socio-cultural points of importance during the Ahom kingdom of which the Dehing Satra is also famous. The ancient relics of the Ahom times can be seen here in the centre and the greenery around allows the tourists to breath in some fresh air away from the city. The history behind the Satra is fascinating and makes it a must-visit while in town! Located about 5 km North of Chabua, the Dinjoy Satra was established by Aniruddha Dev. This was later shifted to Khutiaputa. Later, it was brought to Dinjan after which is was renamed Dinjoy Satra. Since the relocation, it has been kept at the present location. Like all the other Satras, the Dinjoy Satra too provides a rare experience of getting to know Assamese culture and history through art and folklore. The centre is famous for its historical importance and remains one of the most popular tourist destinations. 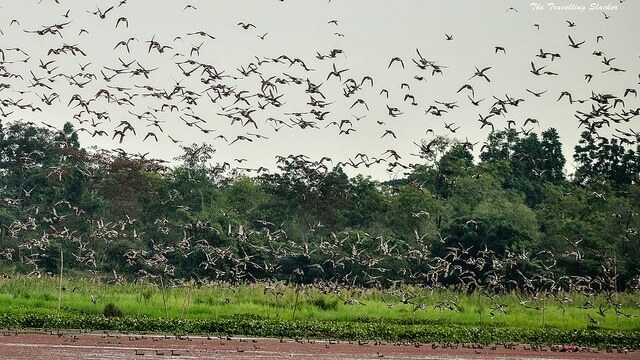 Known as the home of White-winged wood duck which are rarely found, Dibru-Saikhowa national park is famous for being one of the best places around for bird-watching. The park is also a habitat to animals such as the water buffalo, wild horse and langurs. A must-visit for any bird-lover, the park is located 42 kilometres away from the main city and is worth the day’s trip down to experience the wildlife! The Jokai botanical garden is located around 12 kilometres from the town and has a range of rare species of flora and fauna. The garden has orchids, medicinal plants as well as aromatic plants. The garden also has a pond that attracts tourists for its boating rides. Tourists can also opt for elephant rides and experience the lush Jokai Reserve forest known for the migratory birds that come to visit the area. Perfect for a sunny day, the botanical garden is a must visit for families and travellers alike! Dibrugarh is the perfect blend of city and nature with national parks and well as all basic amenities met in the town area. The city is known for its cultural importance as well as its commercial and industrial significance. To truly experience Assam, Dibrugarh is perfect for a week-long getaway for families and travellers looking for an incredible experience of getting to know a different culture altogether and experiencing the richness of the flora and fauna of the North-East. The city has pleasant weather throughout the year although during the rains, the excessive water may flood your plans to go out as the rain can become incessant. All in all, Dibrugarh is a must-visit for anyone who loves to travel and experience new places and cultures!